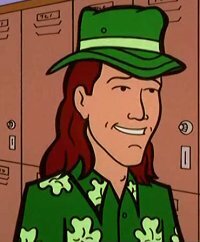 St. Patrick's Day is a holiday character and national stereotype who, along with Cupid, arrives in Lawndale in "Depth Takes A Holiday" searching for Christmas, Guy Fawkes Day, and Halloween, who have escaped from Holiday Island. St. Patrick's Day is described early on as a leprechaun but if so, he's a pretty tall one. As he and Cupid are specifically on the mission, he is presumably one of the more competent holidays; he's the leader of the duo, but gets irritated with Cupid's laid-back, passive nature. In "Depth Takes A Holiday," St. Patrick's Day was shown to have breath that smells of beer; this was accompanied with a small, visible exhalation of green-colored breath. He mentions that the 'beer-breath' is "congenial"; even more interestingly, St. Patrick's Day mentions that he is not a drinker. Because he is an Irish holiday, St. Patrick's Day holds a lot of animosity towards Guy Fawkes Day, who is a British one. He once grumbled about being "oppressed for four centuries" - roughly when the Tudor conquest of Ireland occurred, when England (which already officially ruled Ireland) deliberately tried to devastate Gaelic culture and polity - but in the present sense, so he's presumably an Irish Republican and views Northern Ireland as occupied land. St Patrick's Day would probably be very upset to find out that many British people celebrate his day (i.e. all of them who like to drink). In the Latin American (Mexican) dubbing, he is given an Argentinian accent. Someone will ship this one day. St Patrick's Day has had a surprisingly large amount of fanfic appearances! A number include Cupid. This page was last edited on 1 April 2019, at 03:11.